Thanks to an announcement by Tokyo Book Store Village Books, a marvelously illustrated official crossover comic of epic proportion for the clash between the original Super Robot “Mazinger Z” and the Super Robotic Lifeforms “Transformers” will be published. The announcement dubbed the book as a realization of the miraculous crossover between two of the world’s most famous robotic hero properties. The book will be produced in B5 sizing (176 x 250 mm or 6.9 x 9.8 inches), with a unified story and full color illustrations in an American Comic art style by a team of 6 prolific Japanese Artists. 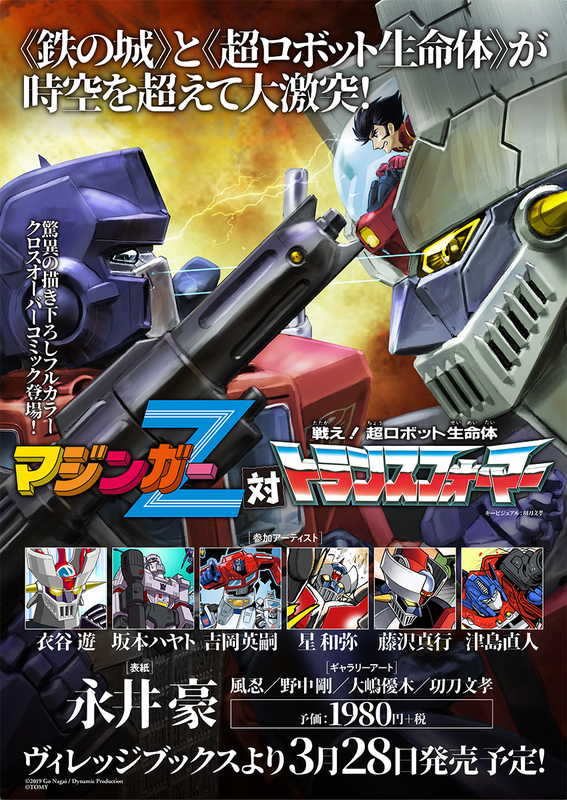 According to the synopsis, the story will be about forces of the Cybertrons and the Destrons being sucked into a space-time distortion across dimensions, then appearing in a time Japan where Mazinger Z is active. It is here, along with Dr. Hell and Baron Ashura, that a battle will be unveiled between the 4 sides. The team of artists on this book includes: Yuu Kinutani (The Apocalypse of Devilman, Ghost in the Shell: Stand Alone Complex), Hayato Sakamoto (The Transformers: More than Meets the Eye, Takara Transformers Legends Manga), Eiji Yoshioka (Transformers Illustrator, eHobby Comics), Kazumi Hoshi (Mazinkaiser SKL, Dino Getter), Hidetsugu Yoshioka (various packaging art from Transformers Masterforce, Victory, and Zone, eHobby, Henkei), and Naoto Tsushima (Henkei! Transformers packaging artist, various IDW Transformers covers). The normal release cover will be done by Mazinger Z creater Go Nagai himself. The book will feature 4 different covers with one on the normal release, one on the Amazon Japan exclusive, and two store exclusives versions at Village Books. The book will be 104 pages long, with a release date of March 28th 2019 and a retail price of 1980 Yen.